Since I was kid I have always had a love for the art of Dutch abstract artist Piet Mondrian. I remember my uncle had a book of artists and he was one in it who fascinated me. If you are not familiar with his work, he’s the one who did the intersecting black horizontal and vertical lines creating squares which were occasionally filled by primary colours. One of his works is the image here. What is it about Mondrian’s work which I like? And what has this blog got to do with mediation?! Art criticism is of course an art (or science?) in itself. People do it as a career. So I am a little hesitant to dive in there. But aside from just saying that his work is aesthetically pleasing, Mondrian was reducing line and colour to its most simple and understandable elements. His lines are the elemental opposing directions: positive and negative, ying and yan, often also thought of as feminine and masculine. The flat primary colours also present dynamic tensions, with the overall effect being harmonious. There are indeed echoes here of a mediator’s process. We start with opposing elements, sometimes quite rigid ones. Further surprise elements/positions arise as we proceed, which are also in apparent tension. But somehow if we take the ‘big picture’ (pun intended!) we can achieve a harmonious outcome. 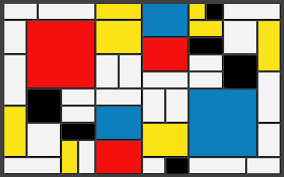 It is often hard to match Mondrian’s paintings with his titles. They tend to be called things like ‘Composition with Blue, Yellow, Black, and Red’ and variations on the theme. The titles themselves seem to lack imagination. But that’s really his point. What more is there to say? The art speaks for itself. Just as the mediator should not impose his own values on the mediation, the artist, or this artist, does not seek to impose his interpretation on his work. Let the forces find their own way. Let the parties mediate.